Speak to your boss and/or the HR department. Deliver an official letter of resignationResignation LetterA resignation letter is an official letter sent by an employee to their employer giving notice they will no longer be working at the company. The goal of a letter of resignation is to create an official record of notice, provide details about the employee's last day, next steps, etc. This letter template. If you still have a copy of your original agreement, it will outline how many weeks of notice you agreed to provide your employer, which is important to know before you announce that you’re quitting. Additionally, it may contain other information about company property, non-solicitationNon-Solicitation AgreementA non-solicitation agreement is a contract that restricts an individual (typically a former employee) from soliciting employees or customers after the employee’s departure from the business. A non-solicitation agreement can be in the form of an entire document or a clause in an employment contract. of employees or customers, and other clauses that are important to know when resigning. 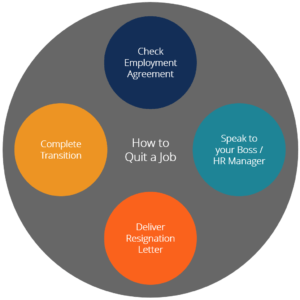 Once you know the legal details (see step #1 or speak to a lawyer), you should go a speak to your boss or someone in Human Resources (HR) before delivering your written letter of resignation. This is the most “official” step of how to quit a job. After you’ve spoken with your boss or HR, it will be much easier to write your resignation letter, as you will have agreed how much notice you’re giving, what the transition will look like, and the tone of your departure. The letter should be short and to the point, and only a few sentences or paragraphs long. Once you’ve written it, either email it or print and hand deliver it your boss and HR manager. To help you save time, see CFI’s Resignation Letter TemplateResignation LetterA resignation letter is an official letter sent by an employee to their employer giving notice they will no longer be working at the company. The goal of a letter of resignation is to create an official record of notice, provide details about the employee's last day, next steps, etc. This letter template. After the notice has been officially made, all that remains is to deliver on what you agreed to do in your discussions with your boss and what you stated in your letter. This will be a big part of your professional reputation and will play a big role in determining how you’re remembered by the people at the company. Depending on your job, you may be asked to leave immediately, and this step won’t happen. Explain to the members of your team all the things you do and how you do them. Organize your files and share them with the team. 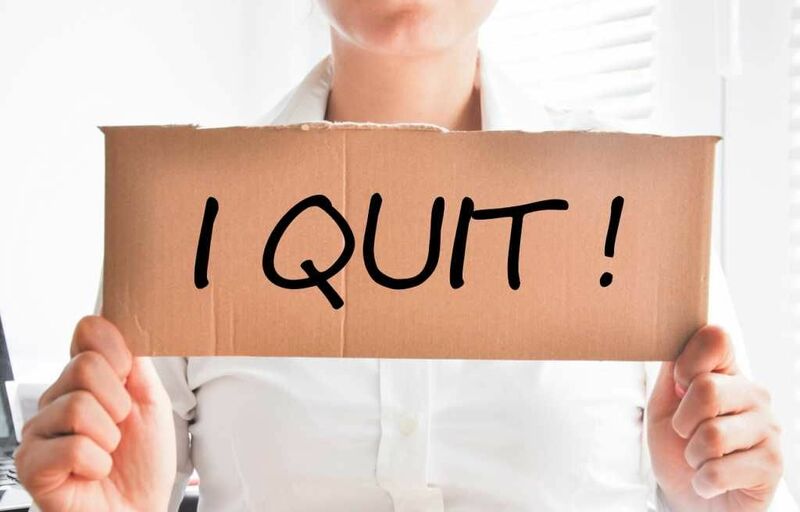 Let’s discuss a few more important things to keep in mind when quitting professionally. Below are some general guidelines that help expand on the four steps outlined above. Hopefully, you’re lucky enough to be in a positive personal situation where you’re either leaving because you found a better opportunity, or you’re voluntarily ready for a change. In this situation, your focus should be on helping your employer with the transition and doing all you can to get a positive reference from the situation. If you’re quitting after you already have another job offer (ideal situation), you’ll need to coordinate with both your current and future employers to make sure you get the timing right. Who knows, you may even have time for a short vacation between the two jobs. The reality is, many of us will eventually be in the situation where quitting is the last resort in an undesirable situation. If you’re leaving because you can’t stand it any longer, your approach will be different than that described above. In this situation, it’s important to be very well prepared and act as collectedly as possible. If there has been a human resources violation by your employer, you should speak to a lawyer to plan the appropriate response. When the situation is tense, knowing how to quite a job professionally is extremely important. Get legal advice, know your rights, and be professional at all times.